Hello Ladies. If you haven't seen my post yet published on MindBodyGreen, you can check it out here. It's filled with daily self-care practices that will serve as a great reminder. Go ahead, give it a go and share it with all of the important women in your life. To make sure the men don't feel left out, this post is dedicated to simple, small changes that can be made in order to protect their health as well. How many commercials do you see on a daily basis regarding low T? The truth is, low testosterone is currently an epidemic. There are a lot of chronically tired, over worked and very stressed guys out there who are suffering in their 20's, 30's, 40's and beyond. Avoiding medication is critical if possible, especially at first. I suggest trying natural ways to increase your testosterone, before taking that plunge. Make sure you talk to your doctor and figure out the best option for you. 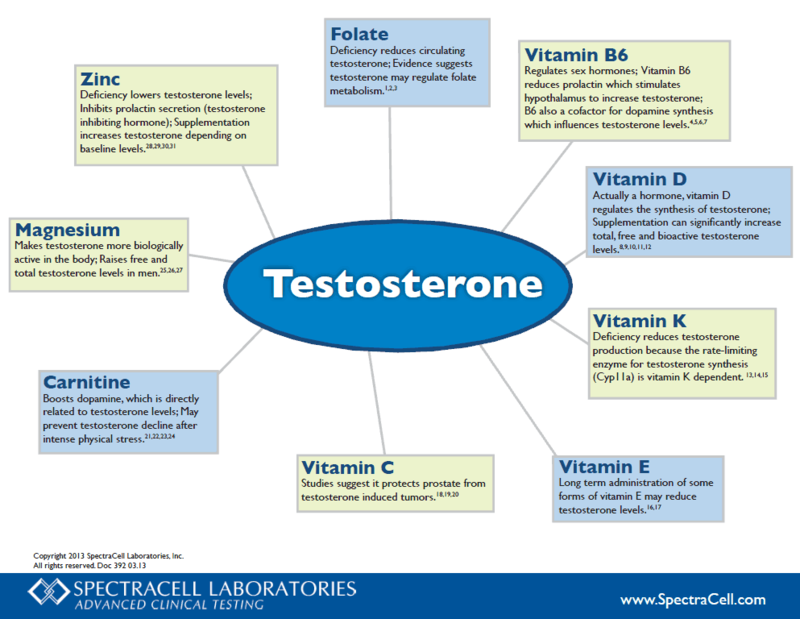 From a holistic perspective, there are certain nutrients that can help increase the natural production of your own T. Most of the time, when a man finds out he is low in testosterone, he is depleted of many of these very necessary vitamins and minerals. There are specialized tests you can take as well that will tell you exactly what your body is in need of right now. *To see a bigger version of this image click here. Also, making sure you are getting 7.5 to 8 hours of sleep every night, training smart, nourishing your body with the right protein, carb, fat ratio and finding ways to reduce stress are equally as important. It sounds simple, but these lifestyle suggestions will only help benefit you in the long run as you work towards balancing your hormones. We live in a world where both men and women are suffering to feel energetic and vital, so it's time to put yourself and your health first. We innately know more than we think we do! It's a matter of listening to your body and what it is trying to tell you.